Traveling can be an exciting and pleasant experience when you have everything planned ahead in time – destination, finances, baggage, flight, and hotel bookings. When it’s just grownups in the picture, things fall into place pretty easy since adults know their way around. However, if you have a baby on-board, traveling is not always simple as it looks. “It’s a toddler, after all; how challenging can it get,” you would ask? Think about it – The baby is as delicate as a feather and needs all the care and attention in the world. Besides ample change of clothes, you need to carry a baby bag with the diapers, burp napkins, wipes, blankets, plastic bags – the list is endless. If you like to travel light without too much baggage weighing on you, traveling with a baby would beat the purpose. 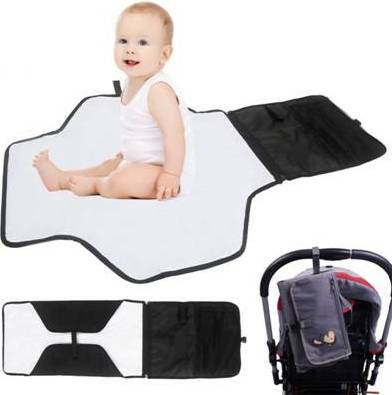 Getting a hold of top-quality baby travel changing mat can go a long way in making your travel a splendid adventure rather than a sorry incident. Since you can’t leave your baby behind while you’re globe-trotting, the only other way that might make sense would be to pack just the essentials for the family. You might have to make peace with just one or two pairs of trousers, a pair of jeans, and two or three shirts at the most. If that’s not enough, you’ll need to raise the bar and pack to your heart’s content (remember, the baby’s baggage needs to be well-equipped). You’ll realize that you can’t afford to leave anything out from the baby bag if you have experimented with it before. Whatever is the mode of transport you have in mind, changing a baby’s diaper on-the-move can be quite the challenge for any parent. Your baby’s comfort is priority, and you want to do everything to make sure your little one is comfortable and safe. Sometimes, we just got to manage cleaning up the unsuspecting infant on the back seat of the car or a cramped enclosure on the flight. It’s not the safest way at times, but it’s all you have got to make things work in a moving vehicle; if you aren’t careful, the baby might slide down. While you’re trying to change diapers, you’re also constantly trying to maintain the balance and keep the baby from slipping and falling. But say “hello” to this absolutely fantastic intervention designed to make traveling an easy-breezy walk-in-the-clouds experience. It’s compact, lightweight, and has the right number of pockets to stow baby diapers, cream, wipes, and anything else your baby needs. The baby travel changing mat is truly a must-have when traveling is on the cards. All set for your next around-the-world tour? It’s time you did yourself a favor and prepare for the adventure in style with a splendid well-rounded travel bag that’s exclusively designed for your baby. Breaking away from traditional ways of carrying an extra bag stuffed with babyware has taken a turn for the better. While you make the most of your trip, your little one enjoys luxury in a whole new light.